It was a feat only few could have accomplished. Braving all odds—an invisible enemy and a hostile terrain—Capt Anuj Nayyar of 17 Jat was aware of only one thing. The eviction of Pakistani regulars from Pt 4875 in Kargil was crucial if Tiger Hill had to be recaptured. But the task was nothing short of impossible. Despite heavy firing and shelling, Anuj and Hawaldar Hari Om charged up the steep slope, shouting "Jat Balwan, Jai Bhagwan". They destroyed the first bunker and charged for the next. Hari Om fell to enemy fire but Anuj continued to the third and succumbed after a rocket hit him on the head. Enraged by the death of their officer, the remaining soldiers accompanying their captain pressed on and accomplished the mission. Anuj was awarded the Mahavir Chakra for his supreme sacrifice. But two years after the war, words like "bravery" and "supreme sacrifice" seem like mere phrases written on commendations and citations. Mere words, indeed, that pepper politicians' speeches. Every year, platitudes are mouthed in July-end when it's time to commemorate Vijay Diwas and again on August 15. This year too it was the same story. Prime Minister Vajpayee started his Independence Day speech from Red Fort by paying his respects to those who had laid down their lives for the nation. This year, however, the celebrations were slightly different. Prof S.K. Nayyar, Capt Anuj Nayyar's father, went up to the PM and said: "I gave my son to the country in its war against Pakistan but now I am fighting a war against your bureaucracy." This is how families of most of Kargil's martyrs feel now—betrayed and let down. Two years ago, the Vajpayee government, still flush with victory, had offered petrol pumps and gas agencies to all such families. Now, Prof Nayyar, proud to be a Mahavir Chakra awardee's father, risks becoming a mere statistic tucked away in government files. So have all the others. Of the 446 families that applied for retail outlets for either petrol pumps or lpg agencies, only 308 letters of intent have been issued, and of these only 113 are operational. The bureaucracy—be it in the office of the dcp Licensing, the water department or the electricity department—has spared no family, it seems. Prof Nayyar's application for an noc gathered dust in the dcp Licencing's office and all pleas came to nought till he wrote to home minister L.K. Advani. He had to, for petrol being an 'explosive' item, an noc is the first step in the many to follow before the pump becomes a reality. Nayyar got his noc within two hours of Advani reading his letter, but as he says: "How are wives of jawans living in remote villages ever going to access the home minister and why do we need to approach the highest authority for something that the government itself promised us?" Ask Nirmala Devi, wife of Hawaldar Hari Om, who lives in Khungai village in Haryana's Jhajjar district. It may be only a two-hour journey from New Delhi, but Nirmala cannot leave her home to chase bureaucrats. She did what she could through the district sainik board—file an application for a petrol pump. But two years have passed and the state government hasn't even earmarked the piece of land on which her pump is to be constructed. Of course, chief minister Om Prakash Chautala showed up twice—once for her husband's funeral when he placed his hand on her head and said: "You are a desh bhakt's wife" and again a few months ago when she constructed a samadhi for her husband in the village. She reminded him then of the promised land and has done so again through her brother, the only family member willing to lend her a helping hand. Her in-laws—residents of the same village—have stopped talking to her except when trying to persuade her to transfer the letter of intent—a document that testifies to her being the owner of a pump. She does what gives her a sense of peace—praying at her husband's samadhi, where he stands statue-like, his chest proudly displaying the sena medal he won posthumously. But for the statue in olive-green which heralds your entry into Khungai and the garlanded pictures of Hari Om in the one-room home where Nirmala now lives, there is no trace of it being a martyr's village. The sarpanch, in fact, even asked the "brave soldier's" widow to pay up Rs 200 for the sand he got thrown outside the samadhi after the rains. 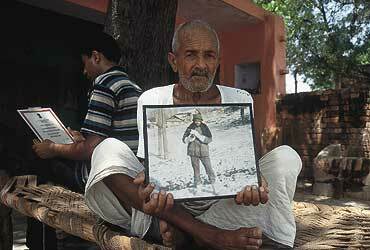 Take, for instance, Satya Devi, mother of grenadier Naresh Kumar (18 Grenadiers). She was allotted a retail outlet by the Indian Oil Corporation in Chandigarh (Letter no GM/PSO/OP Vijay/Mandi, dated June 1, 2000), but that's all she has to show—though Indian Oil has identified a piece of land which belongs to the state transport department, the government is unwilling to part with it. Satya Devi has written to the PM thrice but has not even got an acknowledgement in return. "Himachal has a bjp government and still there's no help. I think desh bhakti is a sentiment only amongst the uniformed people. Nobody seems to be bothered that my son died for the nation." The only help she is getting is from 18 Grenadiers itself. Its commanding officer recently wrote a letter to the state CM requesting him for his personal intervention, saying the "late Grenadier Naresh Kumar, number 2690380, sacrificed his life for the nation... and the parents of the martyr are now running from pillar to post but to no avail." In UP's Surana village, a few kms from Modinagar, sepoy Surinder Pal's parents are similarly disillusioned. Says Bhim Sen, Surinderpal's grandfather, stroking his picture: "I used to tell myself that my grandson (1, Naga regiment) died for a cause. But having hit our heads against bureaucratic walls, I am wondering why he ever joined the fauj." Streets choking with mourners at the arrival of body bags and the entire village promising to be like a family are all things of the past. Forget empathy or even sympathy, the widows and parents of Kargil casualties are struggling to get what is rightfully theirs and what was promised to them. After applying for his pump in July 1999, Prof Nayyar slated its inauguration for January 2001 but had to postpone it because senior officials in the Delhi Vidyut Board were quite blunt. "The normal cost of an electricity connection is Rs 3 to 4 lakh," he was told and when he protested saying it was a Kargil case, he was horrified with the pat reply: "Ok, since it's a Kargil case, we will give you a discount. Pay up Rs 1.5 lakh." Says Nayyar: "Everybody wanted a piece of the cake. Some wanted a small piece while others wanted a bigger one. I live by certain principles even though I end up suffering." Suffer he did, for when he tried to tell the dvb officials that he would complain about them, they said: "If you tell the PM, we will cut off his connection and if you complain to the president, we will even cut his connection." Dejected, Nayyar decided to spend Rs 3 lakh on a generator instead of paying it as a bribe.His pump in Vasundhara Enclave in Delhi—called Kargil Heights—has been running on a generator since March this year. He decided finally to write to the PM and defence minister Jaswant Singh. Eventually, the dvb's vigilance department ordered an enquiry and suspended three officials, but he's still awaiting his electricity connection. Hamra, wife of Lance Naik Ahmed Ali, has learnt to be strong after her husband's death but her problems are unending. If it isn't the police asking for free petrol, it's the rich men in Haryana's Tauru sub-division who harass her so that she sells the pump to them. Words like "widow" and "Muslim" are repeatedly flung at her but she's been strong. Says she: "I will not let my husband's sacrifice go in vain. I will continue fighting. But what saddens me is that while my husband fought an enemy country, I am fighting my own people." She went to the Tauru police station after one of the seths—she refers to him as a big man and refuses to name him for fear of reprisal—started a fight at the pump when he wanted to drive away without paying for the petrol. Even the cops weren't of much help—they took Rs 1,000 just to lodge a complaint. Not that it stopped the seth. When he again refused to pay up, she had to approach the district police chief. The seth has stopped visiting the pump, but now there's another problem: she still gets messages from him, urging her to sell the pump. Like Nayyar, she too had problems getting an electricity connection but unlike Nayyar, she had to pay for her 'piece of the cake'. She cannot leave her five daughters and two sons—the youngest was only 20 days old when her husband's body was brought home—to make constant trips to Chandigarh. And even when she does, she's not too hopeful of getting an audience or help from the top. She still pays a monthly sum of Rs 3,000 to the foreman to ensure that she is not troubled with constant power cuts. This, in spite of paying a bribe to get the connection. Nayyar, Nirmala and Hamra are not the only ones who have stories to tell. Stories that speak of apathy and reek of corruption are rampant through various villages and towns that only two years ago were alit with patriotic fervour. Like most of the 446 families who applied for their connections, Anita, widow of Naik Rampal of 9, Mahar regiment, and a mother of three, is struggling in Soldha, a remote village in Haryana while many miles away in Uttar Pradesh, Surinder Pal's family still mourns the death of their 21-year-old. So far, all that Surinder's family has is his last letter which they received a week before his death. The families continue to survive but only just. Ask Prof Nayyar and he can't wipe from his memory the face of the men who looked at Anuj's picture put up at the pump and said: "Oh this is a good business. Send your son to the army, get him killed and get a pump in return." Except for the next of kin, the brave men who made the supreme sacrifice have truly been forgotten. They are mere words and phrases—written on commendations and spoken of in politician's speeches.